Today's outdoor rooms were inspired by pergolas, gazebos and arbors. Spring is in the air, and many homeowners are itching to start spending time outdoors under the pergola. Latin in origin, Pergola is an English term, originally borrowed from the Italians. A pergola is a freestanding garden structure that forms an outdoor sitting area, walkway or passageway, and they have been the scene of many a romance novel or film worldwide throughout history. Also known as a gazebo or arbor, pergolas of yesteryear offered a sitting area designed for sitting with some protection from harsh sunlight. In essence, these structures have had a resurgence. 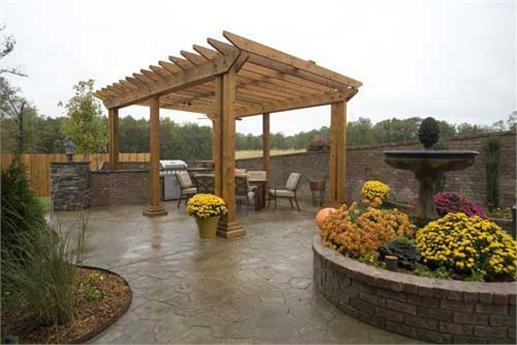 In simplest form, a pergola is a covered area and place for you to relax and enjoy the beauty of your backyard. Today, they are the hub of a family’s social life. Complete outdoor garden rooms where family and friends may relax and enjoy fresh air and beverages while entertaining guests, these more modern outdoor rooms even include comfortable furniture, wireless televisions, fire pits, and kitchens! Pergolas were probably inspired by the late medieval green tunnels found in early Renaissance gardens. These were made from springy withy shoots to create a row of arches that were loosely woven slats on which the vines grew, providing a cool shaded passageway. Traditional pergolas are built out of stone, brick or wood with vertical pillars that support cross-beams and an open lattice where vines are trained to grow. As a type of gazebo, these structures can be an extension of a building or serve as protection for a back patio. Most modern day pergolas are also made out of weather-resistant woods like western red cedar or coast redwood. Today’s lesser expensive low maintenance pergolas are made out of aluminum, CPVC (cellular PVC), vinyl, or fiberglass. Enhanced fiberglass resin is another option that is made to look like wood. Some woods are stained, painted or treated with preservatives so they can be used outdoors. These comfortable and functional outdoor rooms make excellent add-ons to almost any home, and there is a pergola or gazebo to suit almost all architecture styles of house plans from California Ranch to Prairie style house plans to Southern mansions. They are ideal over your spa, near the BBQ, swimming pool, or up on a nearby hillside overlooking a nice view. Building a gazebo-type structure is fairly simple and in fact there are many pre-built brands available at garden centers and home building supply companies. In addition, a contractor can easily design a great outdoor room for your home like this pergola with an outdoor grilling space with flower pots and plants (Plan # 153-1781). Whether you choose a simple gazebo or a large furnished pergola, they are a great way to enjoy the shaded outdoors. Once the structure is in place and furnished, some homeowners enjoy hanging flowers and plants, while others plant one of the many lovely creeping vines to choose from depending on the area where you live. > Morning Glory -a pretty vine that creeps with blue flowers appearing from late summer into autumn. If you decide to build a gazebo or pergola along with your new house plan, remember that they come in a wide variety of shapes and sizes – round, square, rectangular, hexagonal, or even octagonal. Some are also customized for a hot tub, screened in, or equipped with a bar and pizza oven. Others can be built like a mini living room outdoors complete with wide screen TVs, and kitchens.